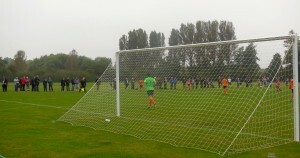 Thames Tour – North Berks Football League ‘Hop’ 2014 » Were you there? Marcus, what did you say? Marcus . . . . shut up. Stop worrying about it, OK? Say, Pleased to meet you. Now pass to each other. 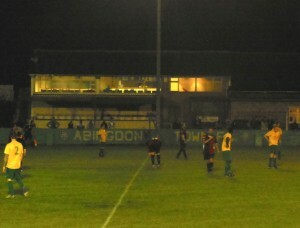 The annual journey down to the affluent mid-Thames basin entered its fourth year with a Friday night visit to league newcomers, Abingdon Town. Their ground is literally within a couple of strides of the river and accounts for it being flooded pretty frequently! 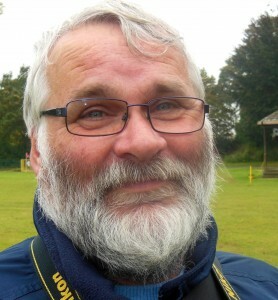 A team that once graced the upper echelons of the Isthmian League, has now subsided into the backwater of The North Berks League, and indeed, for such a big fish to join the minnows, it is hardly surprising that a few feathers have been ruffled amongst their new North Berks colleagues! The ground is way above the standard for this league. Indeed, there have been three-game North Berks League ‘hops’ in the past because no floodlights weren’t always available for an evening match. Behind the covered terrace (above) there are a couple of motor homes which seem to have found a resting place out of season! You can just see the tops of them above the roofed terrace. Below, the club directors and club officials can watch the match behind a glass window in their private eyrie. This must be particularly beneficial on cold and wet winter evenings! Tonight’s visitors were Saxton Rovers, who, last season, ground out a pretty satisfactory sixth place in the top division, but this season, they have already played, and lost, to Abingdon Town on their own ground by 0-4. The final scoreline in tonight’s match was little different from the first match, but The Rovers fought well and it was only two goals in the last ten minutes that gave the scoreline a more positive look in the hosts favour. Graeme appeared bright eyed and bushy tailed with his binimus (as Spooner would opine) as we were finishing breakfast at The Fox in Steventon on Saturday morning. Graeme, it was, who insisted on Allan Ahlberg for the opening poetic salvo, and I was happy to oblige him! With him was Craig who was driving the third binimus and we were soon on our way collecting hoppers from Steventon Green and Didcot Station en-route to the first game of the day at Crowmarsh Gifford, just outside ………….. yes, you’ve guessed it ……………………Wallingford, who were their opponents, today. 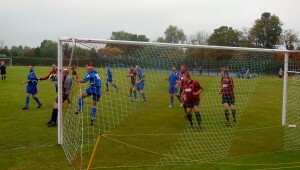 This was a reverse fixture from the very first North Berks League ‘hop’ back in 2011 (Saturday 24th September 2011 North Berks League Division 1:- AFC Wallingford 0 Crowmarsh Gifford 2 attendance:- 157). 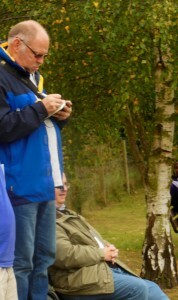 Above is Jack, on ornithological duty and, rather more studiously below, attending to match incidents in his notebook, with height advantage from standing on one of the benches scattered at random around the pitch for the convenience of spectators. beside him below and much more languid and relaxed is Mike, who likes to take the weight off his venerable feet! 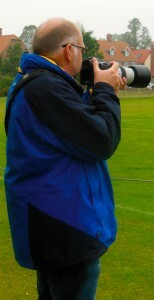 Below, is Martin from The West Country, who never wastes a smile and whose camera is ever cocked to record detail and the unexpected from every match he visits. 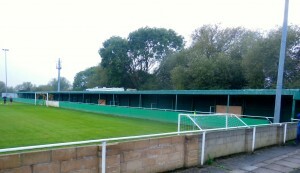 Now this was a true North Berks League ground. The pitch was largely open to the elements (which, unexpectedly chose to desist, today! ), and much of the business of the event was carried under cover of converted garden gazebos and makeshift tents. I sampled a delicious double egg ‘bap’ and somehow managed to avoid projecting any of the yolk onto the front of my shirt – a usual occurrence in such situations! Jack invested in half a dozen bottles of the local ale and I wish I had done the same, but today was the fourteenth day of my annual 100 days without alcohol, so I daren’t take the risk! This was a rugged, dour encounter which was won (as in the first encounter three years ago) by the away team who deservedly scored the only goal of the match just after half-time. Sweet revenge for Wallingford! Dorchester-on-Thames is reputedly one of the most expensive villages in the Oxford-Thames basin. It didn’t look anything special when we arrived, although the fact that I hadn’t heard of it (nor its reputed status), probably added to its exclusiveness! 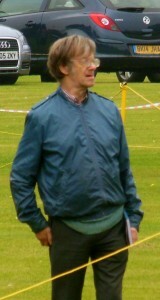 Once again, it was a typical North Berks League venue. 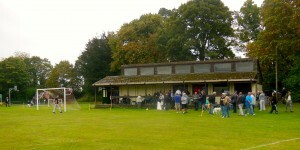 A large playing area on the outskirts of the town with a fine pavilion which was serving food and drink and the usual selection of attractions provided for the hoppers (and locals) to enjoy. Both of these teams are recent recruits to the top division, Ardington having been there for two seasons and last season being Dorchester’s first in the senior flight. However, they have played out some stirring encounters recently and another was eagerly anticipated in the programme notes. 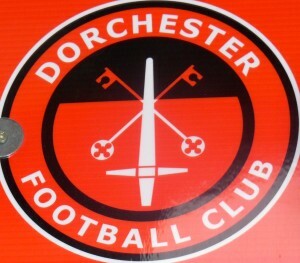 Dorchester have a long history and can trace back their antecedents back to 1887 and matches against Long Wittenham and Radley College Servants! However, their most recent reincarnation came in 2011 and they have made rapid progress through the divisions of The North Berks League since then! 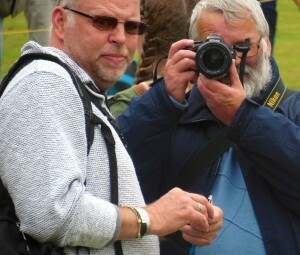 Above, Jack, pensively surveys proceedings, camera at rest, whilst Don retaliates as soon as he spots me trying to capture him on film! The match itself was a bit of a damp squid. The hosts hit the back of the net with two goals in the sixth minute and a third five minutes later. Effectively, the match ended there. The home team were happy with their spoils and the visitors had no keys with which to unlock a stubborn and well organised defence. To make matters worse, they had defender Luke Fairclough sent off for an horrendous challenge in the 72nd minute. The home team had decisively garnered the bragging rights! 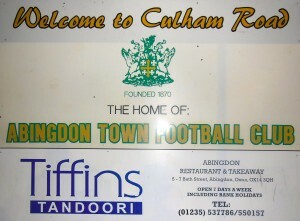 Even the away team had advertised this fixture and the home team had pulled out all the stops for the visiting hoppers! 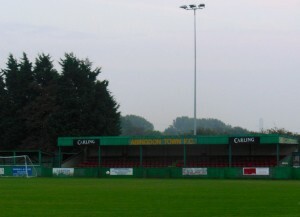 The football pitch and cricket pitch are divided by a club house and changing facilities which serve both sports. Both teams had reached mid-table mediocrity in Division 2 last season, so there was no inkling of the fireworks that were to follow! My son, James, had played cricket for Marcham for five years and even I had been down with my lap top to score matches that he was playing in. 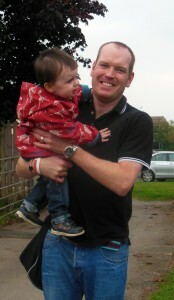 He duly arrived to meet up with old colleagues and brought with him, Sonny, my grandson. He now plays for Chipping Norton, but soon made up for the lost intervening years, despite feeling a tad groggy after Chipping Norton’s Cricket end-of-season bash the previous evening! The less said about the that …… the better! Poor old Marcham. They were right royally trounced and, to be fair, it could and should have been by a far greater margin. 5-0 at half time could easily have been doubled, but the visitors took their foot off the pedal, somewhat, with a couple of substitutions and limited themselves to a further two goals only in the second half. Stuart Armstrong was the home side’s only scorer with nine minutes remaining. He also plays cricket for Marcham’s first XI and during this summer has taken 59 wickets for the club! There was a nursery play pen adjacent to the football pitch and, fortunately, it occupied a good deal of Sonny’s attention. However, it also meant that I missed a couple of goals as I was retrieving him from some malfeasance at the crucial moments! Above, Craig and Laurence look as if they are contemplating whether it was a wise move to place such a heavy wager on a home win! 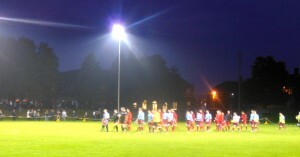 The final match of the day was under the floodlights at The Defence Academy at Watchfield, Shrivenham, half a dozen miles outside Swindon. It was a forces base and we all had to queue and produce identification as per a previously submitted manifest. 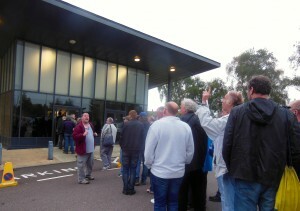 Even the away team, Grove Rangers, who arrived after us in their minibus, also had to queue and be identified! A couple of loose cannon hoppers who were not on the manifest but wanted to see the match, were not allowed entry! The playing fields were spectacular. 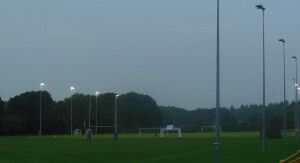 They had a floodlit rugby pitch in addition to the floodlit football pitch and wives and girlfriends had combined to produce a choice of beef or veggie burritos or tacos. Not knowing what either of them were, I stuck to a plateful of salad – lettuce, tomatoes, cucumber and ………….. sliced chilli peppers! 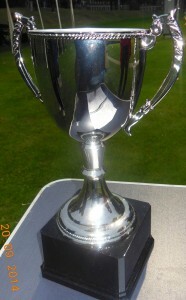 Besides being a league match in The North Berks League 3rd Division, this last match of the ‘hop’ was also contested for a new trophy, The James Rennie Memorial Cup (see above), in memory of James who sadly passed away on 7th May this year. James was quiet and self effacing, but he loved his football and was a true ‘hopper’ and the cup was our memorial to him! 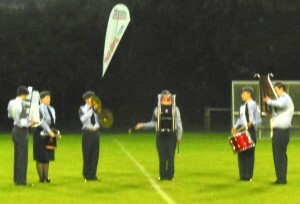 Before the match started (and again at half-time) we were treated to a musical rendition from members of the forces band and when the teams were lead out onto the pitch before the commencement of the match, they were preceded by a drummer who drummed them all the way across the field! The game was reasonable. It seemed that the visitors would prevail, they looked the better side early on, but then, half-time came without a goal and the pessimists were all quoting “this game’s got nil-nil written all over it”. Thirty-three seconds after the re-start, the home side had taken the lead in bizarre fashion. The away goalkeeper collected the ball and kicked it fairly and squarely into the back of the home striker from whence it bounced back straight into the gaping net! 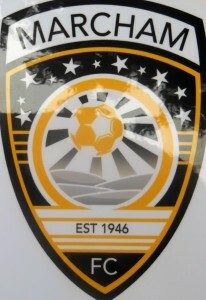 Grove Rangers huffed and puffed and eventually salvaged a point with a goal on the hour mark. The game ended all square and the trophy was shared. 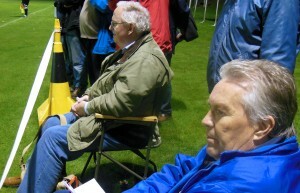 Graeme (forefront) and Mike enjoying the match from the comfort of the occasional temporary seating which consisted of fold-up chairs rifled from the marquees at the bottom of the slope alongside the pitch. Dave Summerbee (left) captain of Grove Rangers and Peter Smiley, captain of Benson Lions jointly lift the James Rennie Memorial Trophy at the end of the match. The crowds drifted away after another exhilarating ‘hop’ event. As usual it was all over in the blink of an eye and very shortly, we were wending our way back to Didcot Parkway Railway Station and Steventon Green, The Fox and The Red Lion at Drayton as hoppers dispersed to all points of the compass. It all had that end of term feeling at boarding school, when the cases are packed and the waving of hands as one awaits the arrival of ‘the pater’ and the journey home. It was a very enjoyable ‘hop’. Thank you, Chris and Laurence!